In the present paper, the problems of formation and observation of spatial and angular distribution of thermal radiation of raining atmosphere in the millimeter wave band are addressed. Radiative transfer of microwave thermal radiation in three-dimensional dichroic medium is simulated numerically using high performance parallel computer systems. Governing role of three dimensional cellular inhomogeneity of the precipitating atmosphere in the formation of thermal radiation field is shown. 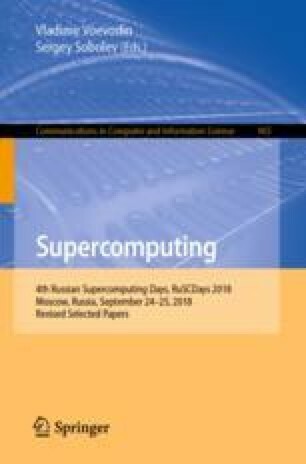 The research is carried out using the equipment of the shared research facilities of HPC computing resources at Lomonosov Moscow State University. Support from the Russian Fundamental Research Fund with grants 13-02-12065 ofi-m and 15-02-05476 is also kindly acknowledged.